I am a Unitarian Universalist minister with dual standing in the United Church of Christ serving the vibrant First Church in Sterling, MA. The First Church in Sterling is a theologically diverse, progressive Christian church affiliated with the Unitarian Universalist Association and the United Church of Christ. We claim among our membership Baptists, UUs, Congregationalists, Lutherans, Quakers, Episcopalians, Atheists/Agnostics, Presbyterians, a smorgasbord of other Christian-types, and Christian-ish folks, and people who don't like labels. What we share is that we seek to gather in the spirit of Jesus, and we are audaciously committed to creating heaven on earth. Please visit my congregation's website. 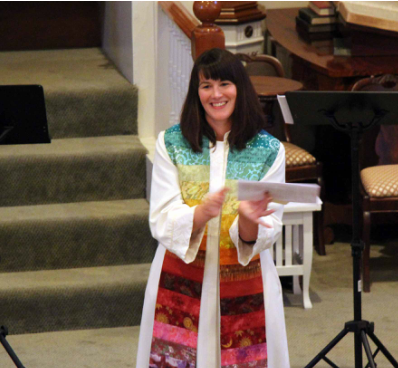 I grew up Unitarian Universalist, and have served the UUA as the Ministerial Fellowship Committee Assistant, the Mass Bay District Youth Coordinator, and five separate congregations as a Religious Educator and Minister. I am a Christian in practice, and take the deep well of my inherited Unitarian and Universalist theological traditions and their accompanying symbols seriously. Like my Unitarian Universalist and United Church of Christ brothers and sisters in faith, I also believe that God is too vast for the canon to be sealed. I believe that no religion or book or human being has cornered the market on Truth. I know that God comes to us in the form of art, music, poetry, sacred scripture from all of the world's religions, and the every day testimony of human beings. I have a pastor's heart, having completed a masters degree in clinical mental health counseling, and having worked in residential and day treatment programs as a clinician for traumatized children and families in the Boston area. I am committed to faithfully serving the inhabitants of this broken and beautiful world in whatever human, imperfect way that I can. To that end, I am passionate about the transformative nature of congregational life, and its capacity to re-imagine earth as it is in heaven. Please feel free to browse this website, which is full of information about me and about my ministry. And please come visit our church at 6 Meetinghouse Hill Rd. in Sterling, MA. We worship at 10:00 am. All are welcome. We truly mean that. All. Contact me here if you'd like to learn more about our church. Copyright Robin Bartlett, 2013. All rights reserved.